Jagworm was loosely based on the idea of games like "Nibbles" or "Snake" yet at the same time featured original ideas and graphics. It featured a humorous cartoon graphic style and fast paced gameplay. The player had to collect all apples while avoiding crashing into obstacles, such as thorns or bushes. Later levels were supposed to have additional settings with their own tileset and unique obstacles. The music created for the game was never used, as it was supposed to be CD Audio which wasn't present in the wip version. However feedback was little and development was ultimately stopped due to lack of interest from the community. As a free download the latest version was however downloaded more than 1200 times as of 2010 without any promotion. 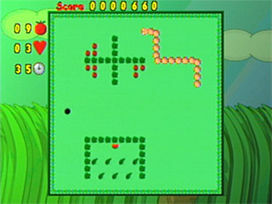 By the time of development, the author had not played a game of "nibbles" or "snake", merely looked at screenshots and build his gameplay around the idea of controlling a growing "worm" by eating objects.